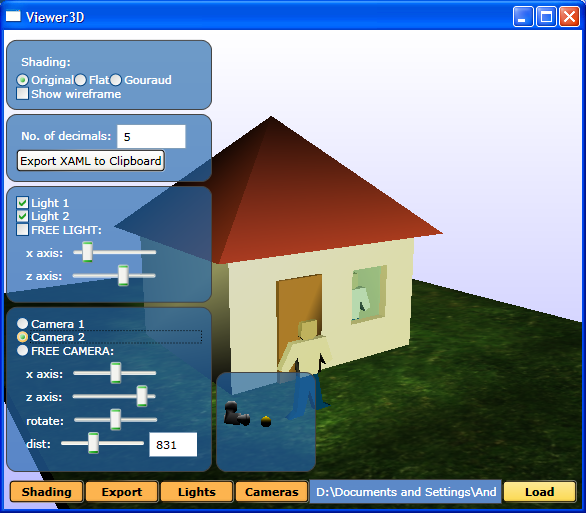 Viewer3D has been improved to work with June WPF. 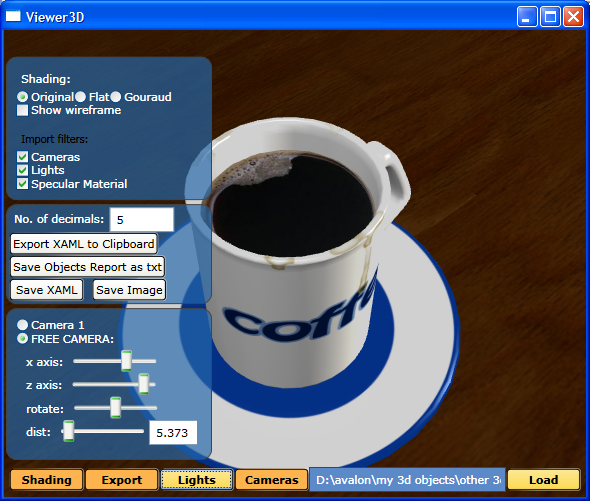 Also a great 3d model of a cup of coffee has been included in the package - a really good demonstration of what WPF's 3D engine and Reader3ds are capable of. As always the Viewer3D is available with full source. All the projects have been updated to work on February WPF. - Reader3ds in now in its own assembly. XamlExport class in MeshUtilities can now export all additional data to xaml text. Usability of Viewer3d has also been improved. The previewing of objects from 3ds files have been greatly simplified. It still has some of the €cookies?€ of WPF like styles, transparencies, animation and triggers. In the new version I have added possibility to drag and drop 3ds files from windows explorer into Viewer3ds. In the free camera mode it is now possible to rotate the camera with your mouse by holding down the right button. And as before the whole application is available with full source code which makes it a great piece of WPF code. I have also added additional documentation and code samples. Reader3ds is a class that can be used to import 3d objects from 3ds files into WPF. - Default material is used for objects that does not have any material information set.